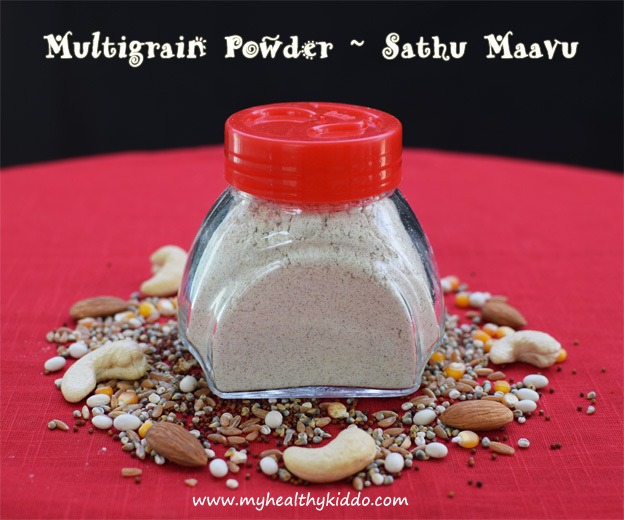 Multigrain powder or Oota sathu maavu is a healthy mix that is traditionally given to babies from 1 to 8 years of age. It can still be taken for the whole life but it is mandated till 8 years as to support the rapid development of the sprouting mind and body. There are lots of brands available in the stores, yet none can compete with the one prepared by mom/granny with lots of care and loads of love. I swear that you could harvest harmony & satisfaction when your baby enjoys this healthy food. Do try and share me your feeling! This is highly recommended for Pregnant Ladies and Lactating moms too as they eat for two and needed more healthy compositions..
3. In the next day morning by 6AM, sprinkle some water over the cloth just to maintain moisture. 8. Once dried completely, fry each item in a pan without oil. Do not burn it, but fry them until browned when nice aroma arises. Fry cashews and cardamoms too. Lastly, put fried chana dal in the hot pan and switch off the stove. Let it be in the hotness for 3 mins. 9. On frying each item, just transfer to a wide plate. Mix all items with a ladle and let it cool completely. Transfer it to the container to be carried to the Flour Mill for grinding. 10. 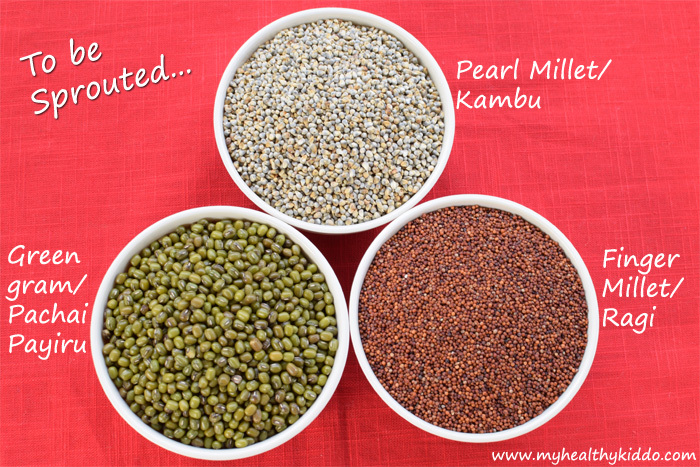 Grind it in the mill and spread it in a wide plate to cool completely. 11. Sieve the flour in small batches and discard the remaining particles from the sieve. Transfer the sieved multigrain powder to 2-3 air-tight containers. Keep 1 out for use and put the remaining containers in your fridge door. Thats it! 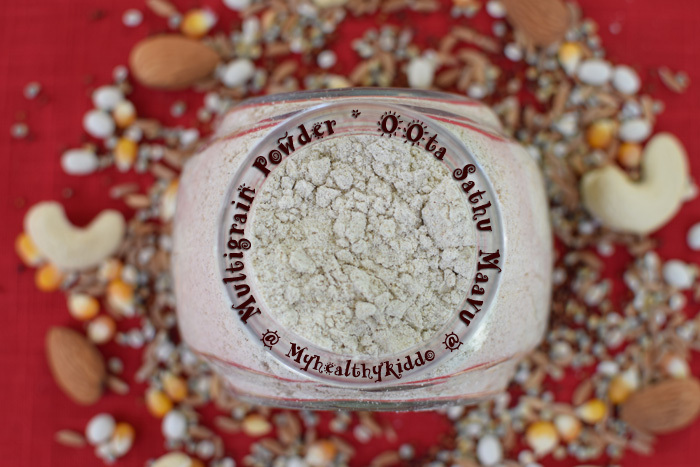 Homemade healthy Mutigrain powder is ready for 6 months 😉 Enjoy by making easy porridge and lovely laddoos! Actually, people advice not to fry the sprouted ones to use the nutrients to the fullest, but I do fry them for a minute as it gives a raw taste if not fried. Use blanched(without skin) Almonds, if available. Else remove the skin of each almond using knife, especially for babies under 2 years. Do not soak to remove almond skin as it might lessen the shelf life of the whole powder. Grind cashews and Almonds in a clean dry mixie jar and add it to the mix before giving it to mill as some nuts might get stuck in the machine bends. Adding roasted peanuts is optional. Omit this if you/your baby have any allergies or even if not given peanuts already. Check with the Mill owner as some do not accept grinding with peanuts. Also, adding peanuts gives moisture(oil) to the flour which will considerably lessen the shelf life. Adding sukku(dry ginger powder) is optional. This is usually added for good digestion similar to cardamom. 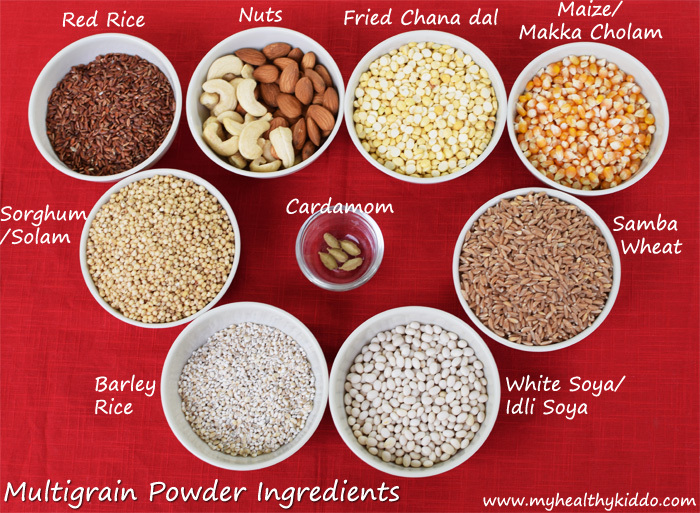 Though adding boiled rice/pulungal arisi is optional, I do recommend adding it as it enhances the taste. After grinding in the mill, keep it loosely covered on the way back to home. If you close it tightly, it would sweat! If you can’t afford 5 days to prepare, you can skip sprouting and save 2 days!